First, there’s the DEWALT name which is known by just about anyone who’s ever even held a power tool of any kind in their hands. Everyone knows DEWALT, and their tools are always worth checking out no matter what kind of tool you’re looking for. Then there’s the descriptive word – “Distinctive”. Who doesn’t want a tool that stands out from the crowd? Or that at least looks different enough that no one is going to mistake it for something else? And then, of course, there’s that “P” word – Penguin. What in the world do penguins have to do with power tools? If you can escape the clutches of your “Honey-do” list, spending a Saturday afternoon visiting the power tool section of your local home improvement store is great for a little rest and relaxation. I was indulging in exactly that kind of afternoon and I wasn’t finding much that I hadn’t seen before, but then I looked up and saw, a few shelves away, a most interestingly shaped tool. I didn’t know what it was and I was too far away to read the shelf tag, or anything else for that matter, so I thought I’d play a little guessing game with myself. From where I was, I could certainly see the colors and I knew the bold yellow and black meant it was a DEWALT. The head was relatively small in relation to the size of the tool, and it stuck straight out like a power drill/driver. The body was long and lean but the one side tapered outward about 2/3 of the way down and then it protruded back out again. There was a black stripe (the trigger, actually) down the center of what looked to me like the “belly”, and with its head pointed to the side, its potbelly, and the bottom which came back out like feet, it looked just like a penguin. I finally had to take a closer look to see what was what. The “what” I found was DEWALT’s DCD740C1 Right Angle Drill/Driver. Now it all started to make sense. The head which pointed out to the side like that of a drill/driver really was one, but it was at a 90 degree angle instead of being straight like all the other drill/drivers I’d seen. The oddly shaped body was the ergonomically designed body with a long trigger which took up about 1/2 of the length, down the center of the body’s front. And the feet that were sticking out turned out to be a 20 max volt battery. Quite honestly, I think it’s one of the coolest looking tools around so I checked out how it felt in my hand and its specs and then I went home to do a little research to see if the reality of how it works lives up to its stand out appearance. First of all, the Power Penguin – I mean the DCD740C1 – uses a 20 volt max Li-ion battery for enough oomph to handle most jobs that don’t require really heavy duty power, without the weight you find in Ni-Cad batteries. There have been a few users who reported they weren’t happy with the torque of this drill/driver, but they may have had it on the wrong speed or they may have expected it to have heavy duty power. The vast majority of users rated it very highly in terms of power, so I’m going to take the few complaints with a grain of salt. Its two-speed transmission gives you a choice of power settings that go up to 2,000 RPMs and it’s lightweight enough (under 4 pounds without the battery) that it can be used for an extended amount of time with limited fatigue. 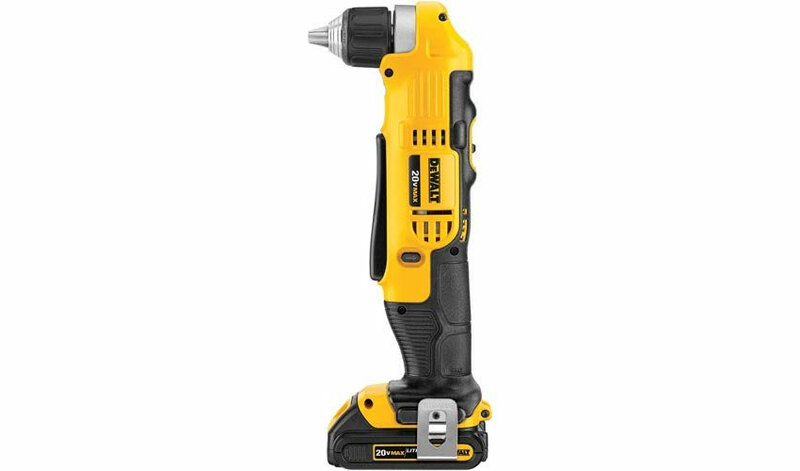 Its ergonomic design and long trigger allow you to grip the trigger with your hand in multiple positions along its more than 12 inch length, and when you combine that with a head width of only 4.6 inches, this right angle drill/driver will fit into small, deep spaces without compromising the power you need. The last major feature I want to touch on is the 3/8 inch chuck – it’s deep enough to take a 2 inch hex bit almost all the way into the chuck to give you superior control even in small areas. You don’t get a ton of extras with this drill/driver kit, but I think you could probably do worse. It’s pretty much a basic kit that includes the drill/driver, one battery and a 30-minute fast charger, a standard belt hook and a plastic storage/carrying case. Like most DEWALT tools I’ve looked at, I haven’t seen many complaints about it and most users who have reviewed it gave it outstanding marks. Personally, even though I love the way it looks, I think this would certainly be a satisfactory tool but I’m not super excited about it for some reason. Like I said, I don’t see anything particularly wrong with it, though, so if you are in the market for a right angle drill/driver be sure you include this one on your list of options to check out before you lay your money down.